A to-do list/syncing note application and reminders go together like egg and cress. It makes you wonder why Evernote hasn't included a reminder/alarm function until now, but whatever the reason, it's been added in the 5.1 Android app update. Just tap the alarm icon on a new note to add one. Reminders for notes or events go in the greater "My Notes" list, allowing you to mark them off as you complete them. Android notifications will keep you up to speed on your approaching deadlines, and you can add email reminders as well. Evernote's visual design is worthy of attention here. Take a look at that spiffy interface for setting a reminder time or due date. 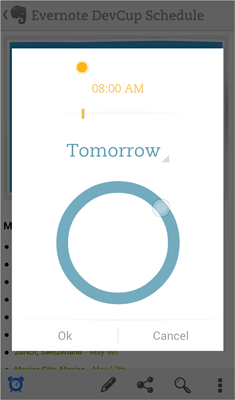 Sliding your finger clockwise around the blue circle will select a date, while the orange slider allows you to fine-tune the time of day. I don't know if this is actually better than the more conventional calendar/clock methods of setting a linear event, but it sure looks more interesting. Reminders can be added to Shared Notebooks and Business Notebooks as well, with individual subscribers opting in or out on a person-to-person basis. Naturally, reminders sync across the Android, iOS, and web versions of Evernote. Other improvements to 5.1 include a better copy and paste implementation, better shortcuts, improved Japanese language support, and a corrected photo order. Evernote says that it may be several hours before the update app appears on all Android users' devices.